Totalcontent | glow-in-the dark ArtCrank poster. Home » blog » glow-in-the dark ArtCrank poster. ArtCrank stages exhibitions of bicycle-inspired posters by local artists in cities across the US and Europe. They’re one-night only pop-up affairs, and attract an audience of cyclists and designers — and some crossover cycling designers. 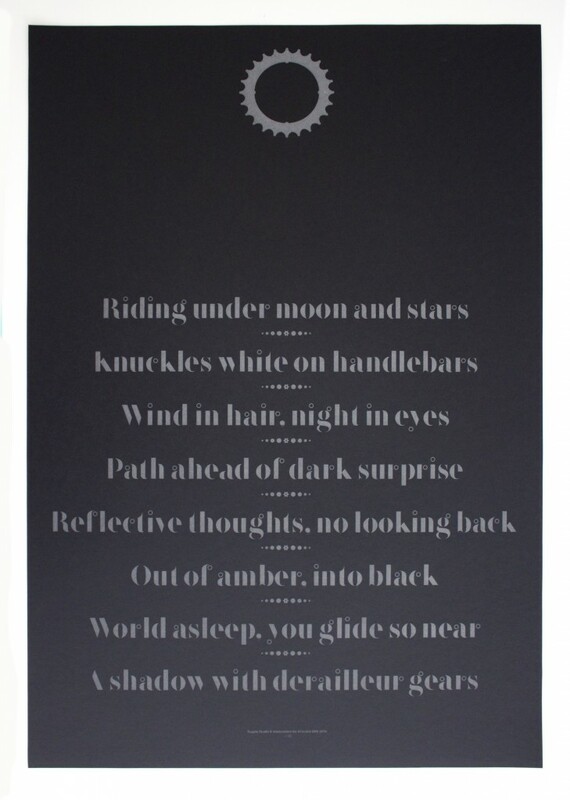 Limited-edition posters are sold for a fixed price (£35), with half the proceeds going to charities like World Bicycle Relief, People for Bikes, and other worthy local causes. Friend and collaborator Jamie Ellul of Supple Studio was invited to take part in the Bristol ArtCrank event, which was held on 19 September at THAT in Clifton. He’d had an idea about doing a glow-in-the-dark poster celebrating riding at night, and asked if I’d come up with some ‘poetic’ words to accompany his imagery. He sent over a scamp of some handlebars and some grainy type caught in a bike’s head lamp. I did some online research and discovered that night cycling has quite a following. It’s all about the freedom. Which is probably why some people even like to do it naked. 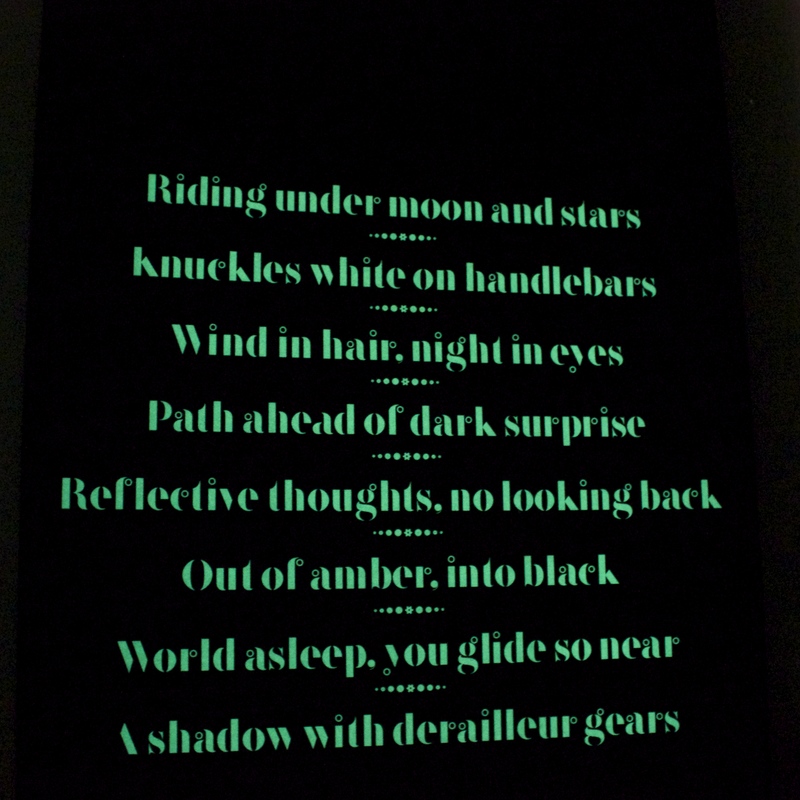 I duly went off and wrote a short, rhyming poem, putting myself on the shoes of a (fully clothed) night rider, trying to capture the rhythm and exhilaration of pedalling away in the dark. When Jamie saw what I’d written, he ripped up his initial design and started again. This time he gave the words much more prominence and used a delicate headline font called Bella Stencil by Face37. He tinkered with it slightly, replacing the embellishments of the letterforms with illustrations of small, sundry bike parts — nuts, bolts, cranks and rivets. At the very top, a chainring doubles up as the moon. The thin lines of the typeface almost seem to disappear into the night. 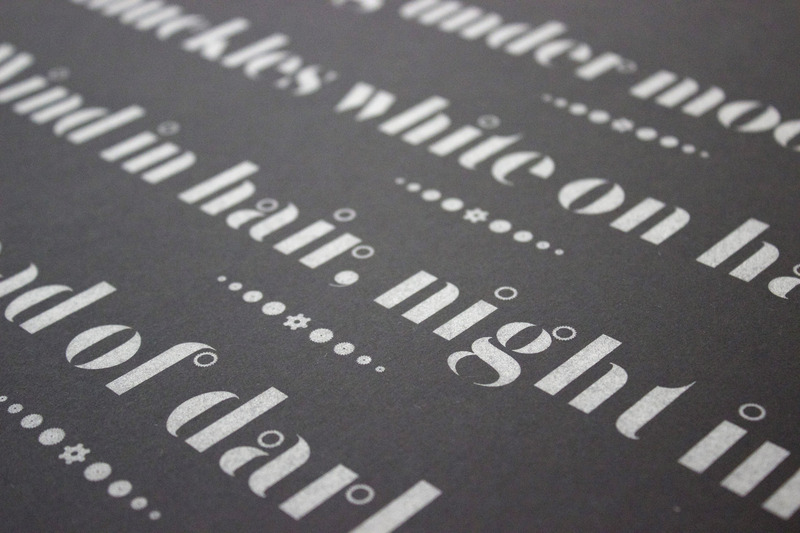 The design was beautifully screen printed on to a heavy black paper. In daylight the printed words look a tasteful light silvery metallic colour, but in the dark they come alive, shining a vivid bright green. Our poster duly took its place among the two-wheeled work of 20 or so other local artists, and got a suitably glowing reception on the night. It sold pretty well too; pedalling our wares, you might say.